While its self-described status as a “biennial” and its patronage by the Egyptian government lent it some gravitas, the twelfth edition of the Cairo Biennial surprised few by presenting very little in the way of good work. Nevertheless, the local press, with a mantra-like insistence, ascribed the sudden increase in winter-season art-world activity to this flawed event. Traditionally, there is an assumption that the biennial brings an influx of international visitors and whets the local appetite for looking at art. How true is this, and (regarding the former) does it make a difference? We can say, at least, that the biennial carries enough symbolic weight to inspire statements of protest, or at least, in this year’s case, productive dissent. I put off seeing the biennial in anticipation of the usual dubious quality of work and shoddy installation. As for the latter, look to Angela Harutyunyan’s online piece in Al-Masry Al-Youm on the DIY ethos of the biennale (including the first reference in text to an elephant in the gallery: neglect). Harutyunyan, who until recently served as acting art program director at the American University in Cairo, plays on the unintended “interactive” nature of the exhibition as the viewer obligingly turns on TV monitors, DVD players, and ceiling lights. Perhaps someone in the Ministry of Culture, which is charged with organizing the biennial, read this tragicomic assessment, because I found things in relatively good working order upon visiting some two weeks later. I only mention this because we search for signs of response from the government: Have these bureaucratic messengers of culture flinched in the face of those clean white cubes sprouting in the Gulf and in their own city, even? An international panel of jurors awarded this year’s biennial Grand Prize to a work that might be understood as a critique of the state’s self-enforced dominance of the cultural sphere. The piece, by Amal Kenawy, is composed of multiple works. At the biennial’s opening it took the form of a performance. The artist used the kitchen facilities she had installed in the museum to cook a meal, which she then offered to the Egyptian Minister of Culture, the long-reigning Farouk Hosny, as he passed through the space, literalizing the work’s “consumption” and recognizing the minister as the primary arbiter of artistic taste. Anyone who missed the opening, however, encountered a room-size installation dominated by the fully functioning kitchen, a dining/picnic table, and a series of shelves filled with plants and household knickknacks. Strings of colored lights wound through elements of the space like a kind of electric fiber. The décor simultaneously invoked a multipurpose domestic interior and an exterior public space. Two videos unified this otherwise scattered context by restating the artist’s engagement with public and private spheres as the work’s central concern. The first loops a series of short “home videos” featuring the artist’s young son playing piano and dancing with his mother. The second, projected on the wall, reads formally as a window with a view onto an outdoor urban scene. In this video, Kenawy corrals a flock of men and women (these included artists and friends, but also young men from the neighborhood who were paid to participate) who crawl across busy downtown streets on their hands and knees. Public performances are rare given the ubiquitous policing (both official and civic) of any site outside of the domestic sphere in Egypt. So to the surprise of no one, crowds gathered around the artist and fights ensued. Intended as an exercise in public engagement, the work does not manage to escape (and seems indeed to celebrate) a quick descent into spectacle, with predetermined roles for its protagonists and an overly familiar script. Accusations flung at Kenawy by incensed bystanders included the charge that the work presents a demeaning image of Egypt to the world: a complaint consistently leveraged against works of art, films, texts, or any contribution to public discourse that doesn’t reproduce the terms of a status quo. A serious indictment of the piece, however, was raised when onlookers objected that paid participants, who didn’t necessarily understand or support the artist’s aims, were coerced into what was perceived as a humiliating performance. Kenawy seemed to cast herself in a heroic role as the defender of art’s right to exit the gallery so as to enter into a more direct relationship with a Cairene public sphere. The invocation of the artist’s domestic life elsewhere in the installation lent this gesture a vaguely gendered inflection. Ultimately, however, Kenawy’s odd insensitivity to the nuances of the class dynamics animating both the art world and its ostensible other — “the public” — suggest that these spheres are even more alienated than we had previously suspected. Across the river, in the decrepit Viennoise Hotel, a group of young artists staged their own DIY exhibition under the tongue-in-cheek title ‘Cairo Documenta.’ Mahmoud Hallwy’s piece (To Be a Hero) comprised three poster-size portrait photos produced, according to the artist’s text, in ‘Am Hamdy’s studio in Torah al-Balad. 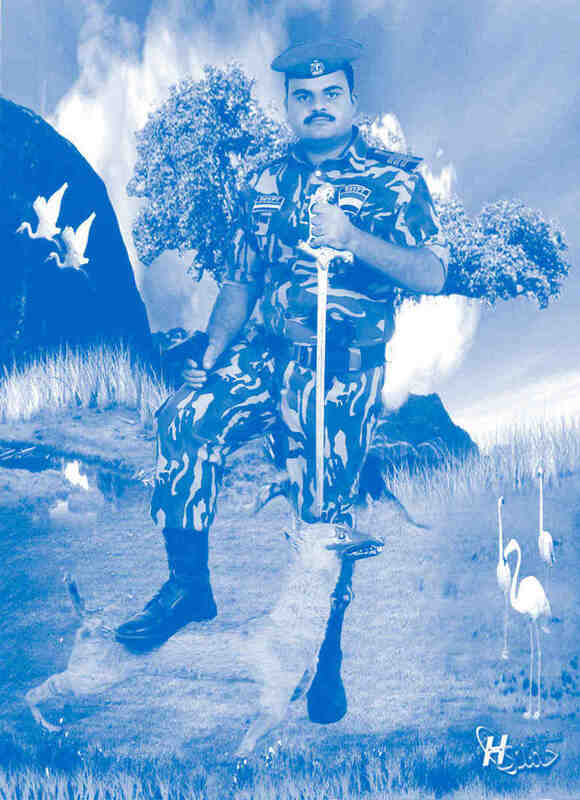 Dressed as an Egyptian army officer, the artist appears against incongruously pacific pastoral, computer-generated backdrops: geysers, a white picket fence, a willow tree, and pink flamingoes. In one, he holds a machine gun while spearing a mangy stuffed fox with his sword. If ‘Cairo Documenta’ became a focal point this season, it is perhaps a result of its promise to offer an exhibition in extraterritorial waters, outside of art world jurisdiction. The exhibition statement, invoking strident language, might be interpreted as a kind of manifesto proceeding through a series of negations, i.e., this is not an institution, a permanent space, or a curatorial initiative. Such claims are legible primarily for their appeal to long-standing ideals (of the artist’s “autonomy”; of a group of young artists asserting their autonomy from authority, writ large) rather than through the unfolding of a focused argument or a directed attempt at critical engagement. Curator Sarah Rifky’s recent text for Al-Masry Al-Youm online raised a similar concern in pointing out the paucity of professional curators and institutional framework for the arts in Egypt against which the exhibition’s claims would seem to fall flat. 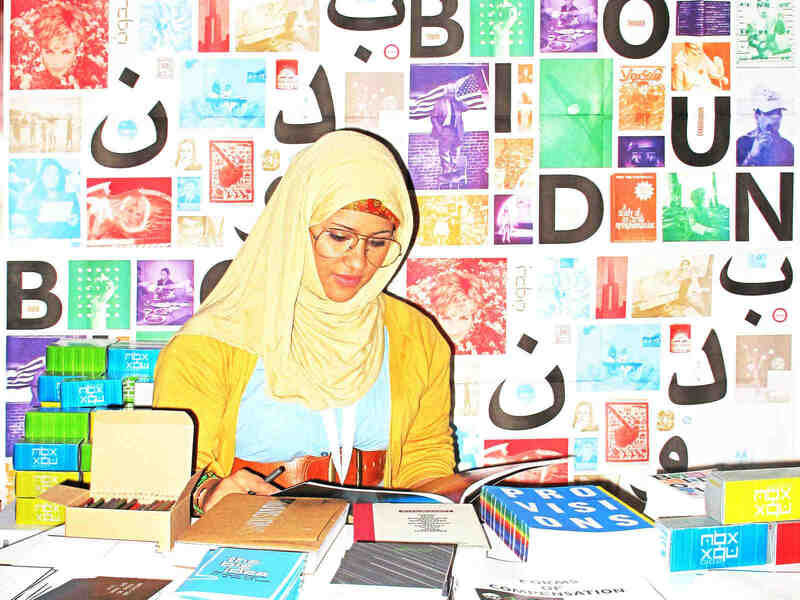 Nonetheless, the “success” of Al-Masry Al-Youm online raised a similar concern in pointing out the paucity of professional ‘Cairo Documenta’ seems to lay bare an elusive space of public receptivity, in which works of art win visibility and attract visits and discussion while avoiding the spectacularization that befell Kenawy’s downtown performance. Both, however, remain squarely within the bracketed space of the art world, despite (and even because of) assertions to the contrary. My favorite work at ‘Cairo Documenta’ was Ahmed Kamel’s two-channel video. A small dog appears on each screen; they face one another and, through their incessant barking, seem to communicate. It’s not clear how this crude dialogue relates to language, what meaning the viewer misses, or even to what extent these interlocutors understand each other, but there is undeniably a conversation transpiring. Encountered in the context of this season’s exhibitions, the work appeared to present the terms of a preferred logic of art world engagement. Speak to us, it seemed to say: resonant, specific, and insistent, yet without the burden of message. New institutions are opening in Egypt: nonprofit and commercial alike, exhibition spaces and educational projects. Cairene collectors seem finally to have been stirred from their deckchairs, and a new collector base is emerging regionally. Members of the state cultural sector are befriending wealthy patrons of an emerging private market. Alongside all this endures an “international” hesitancy to invest at various registers in art coming out of this region. The terms of a meaningful engagement in the context of these intersecting, sometimes contradictory trajectories remain unclear. Merely reinforcing established scripts is clearly problematic, yet for the most part, artists seem unable to change the broader terms of reception despite not infrequent statements of their intentions to do so. The obligation to remain sensitive to how artworks and exhibitions might challenge the established conditions of viewing — and therefore risk invisibility by demanding more challenging terms of communication — seems to have acquired a renewed urgency as of late. At least, my own implication as a viewer lingers in the afterimage of this season’s exhibitions, leading me to wonder if I know what it is I saw. And that may be a good sign.